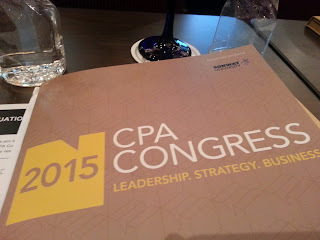 I once again had the wonderful opportunity to attend the annual CPA Australia Congress in Malaysia, this time held at One World Hotel on 22 September 2015. Those of you who attended last year will be aware of the rave reviews it received, with a well-rounded programme consisting of speakers from diverse industries and backgrounds. This year, the theme was "Leadership. Strategy. Business" and it did not disappoint, addressing relevant and up to date issues as well as inspiring takes on leadership and how the profession continues to remain relevant. Although there were a few last minute changes to the line-ups, it did not detract from the overall quality of the sessions. Cyber security - more smoke than fire? By far, this was the topic I found most interesting, moderated by the always engaging Karamjit Singh of Digital News Asia. I have always felt that there has been insufficient attention given to its importance in today's world and it was up to the panelists to paint the stark reality to attendees. Dani Michaux of KPMG Malaysia summarised the situation perfectly: "Sometimes all it takes is one person to click a link". The panelists also described how lax some companies are with security, such as the ease in which some companies allow their vendors access to their system, and even gave a simple real life security example where a panelist was able to walk into the CEO's office and access confidential documents, despite the CEO's insistence that his security would not let her do so. The panelists also stressed the importance of companies identifying what their valuable assets are, so they can prioritise where their security resources should go to. This topic was a fairly entertaining session, The panelists highlighted the actions being taken by both the government and companies with regards to anti-profiteering, but also stressed the importance of the public getting involved. To illustrate the point, the moderator, Thenesh Kannaa of Thenesh, Renga & Associates, asked the public how many felt that there were at least five times since GST was implemented that they felt they were being over-charged, at which almost half of the crowd put up their hands. However, when, asked how many actually lodged a complaint, I believe only ONE hand came up. A member of the public also suggested the importance of managing public perception better so that people are more aware that things are being done to catch unscrupulous traders. The only session which I found problematic was on this topic. I admit to approaching the topic with a bit of bias, as I was wondering how it fit in with the rest of the programme. At the end of the day, all I saw were three developers agreeing that it's always good to buy property, it was just a question of where, surprise surprise. None of them explicitly recommended selling anywhere. So it wasn't just me with a bias, was it? Fortunately, the rest of the programme exceeded my expectations. Alex Malley, the charismatic CEO of CPA Australia, took two sessions. one where he discussed the future of the profession, and the need for them to continue to have a voice in the business community. In his second session, he probed the thoughts and experiences of the new President and Group CEO of Petronas, Datuk Wan Zulkiflee Wan Ariffin. The importance of branding was also emphasised, as well as the need for companies to continue to evolve quickly to remain relevant and keep up with the fast-paced world. On a side note, I also had a splendid time catching up with old acquaintances and ex-colleagues during the breaks. While obviously we got up to speed on a personal note, we were actually also able to discuss ideas and share views on issues of mutual interest. Incidentally, I found out from some of the attendees that progress on the Companies Bill 2013 is expected before the year is over, so we'll be waiting for that. It might sound as a bit of a cliche, but I left the conference feeling genuinely inspired. The event ran fairly smoothly, the speakers were engaging, and the topics were mostly relevant and interesting. I look forward to next year's conference as the Malaysian and global landscapes continue to evolve.